All watch orders received before 3.00pm on weekdays will be despatched the same day to UK addresses by Royal Mail Special Delivery (subject to stock availability), which is guaranteed before 1.00pm the following day and requires a signature on receipt. Watch straps and Kit Markers are despatched to UK addresses by Royal Mail 1st Class and Metal bracelets are sent by Royal Mail Recorded Delivery. All watch orders outside of the UK, will be despatched by Royal Mail International Signed For delivery and require a signature on receipt. All traser H3 watches fitted with metal bracelets are supplied in a standard size that should accommodate the largest of wrists, therefore it is extremely likely that an adjustment will be required for the bracelet to fit correctly when you receive your watch. If however, your wrist size is larger than the standard size, we can supply additional links for a nominal charge. The standard size for traser h3 watches is approximately 20cm / 8 inches. 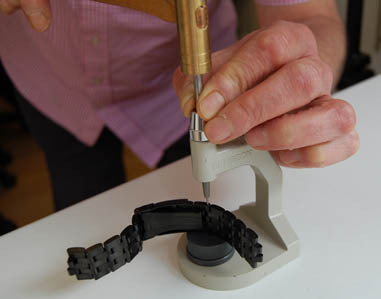 To remove the links in the bracelet, you require a specialist watch making tool so we do not encourage this to be done at home and advise that you take your watch to a local jewellers, where they can measure your wrist and remove the correct number of links for a small charge. From feedback received from customers, this is usually in the region of £5 - £10. Please enter your wrist circumference in the comments field on the online order form or inform us of the size required when placing your order by telephone on 01425 672082. We will include all the spare links removed inside your watch box for future use. We are a BFPO friendly company and can deliver to all BFPO addresses for the same postal cost as UK addresses. All orders will be sent to the UK Distribution centre in Mill Hill to enter the BFPO system. If you are currently serving at a BFPO address outside of the European Union (EU), you do not have to pay UK Vat and need to enter VATFREE in the voucher code to automatically deduct the VAT from your shopping cart. Any orders received using this code that are not applicable, will be cancelled as we are unable to supply within the EU without charging VAT. We accept all major credit/debit cards for payment except American Express. Discounts available for all Military and Emergency Services personnel. Goods remain our property until payment has been received in full. We offer a 7 day money back guarantee on all purchases provided that the returned goods are returned in the same resellable condition as they were delivered. If the goods were successfully delivered, the refund will exclude the original postage charge.